From the left: Rui Xue, Michael Koehler, Kejian (Oscar) Qu, Deepak Sapkota, Amanda Haglund, Paige Kelley, David Mandrus, Rupam Mukherjee, Quinton Wright, Brianna Musicó, Connor Stephens, Candice Kindsler-Fedon, Ganesh Pokharel. Not pictured: Hasitha Suriya Arachchige, Nan Huang, Jiaqiang Yan, Matthew Cothrine, Takahiro Matsuoka. 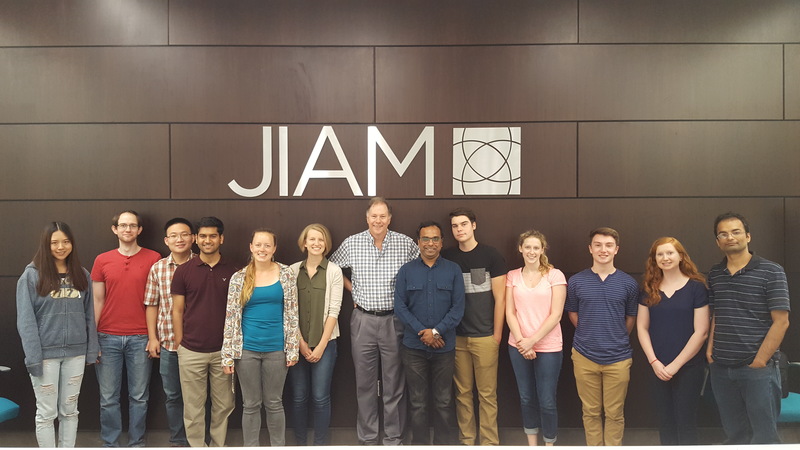 Photograph taken June, 2018 at the Joint Institute for Advanced Materials (JIAM). 7/2018. Brianna attends the National School on Neutron and X-Ray Scattering at Argonne National Lab and Oak Ridge National Lab. 1/7/2018. Hasitha attends the Fundamentals of Quantum Materials Winter School at the University of Maryland. See blog post. 11/15/2017. David was named a Clarivate Analytics highly cited researcher for 2017.